That proud moment when your child mimic’s your positive life choices is one of my favourites. My online store inspired Ava’s inner entrepreneurial spirit and seeing the fun accessories she often creates warms my heart! Ava jumped for joy when I brought out the Gel-A-Peel kits. Gel-A-Peel offers a variety of options from Bracelets, Earrings, necklaces and so much more! First thing Ava tried out was the Gel-a-Peel Sparkle Bead Station where you can design and create your own stylish beads. Comes with 26 design templates, two coloured lanyard options. I believe this one was Ava’s favourite! 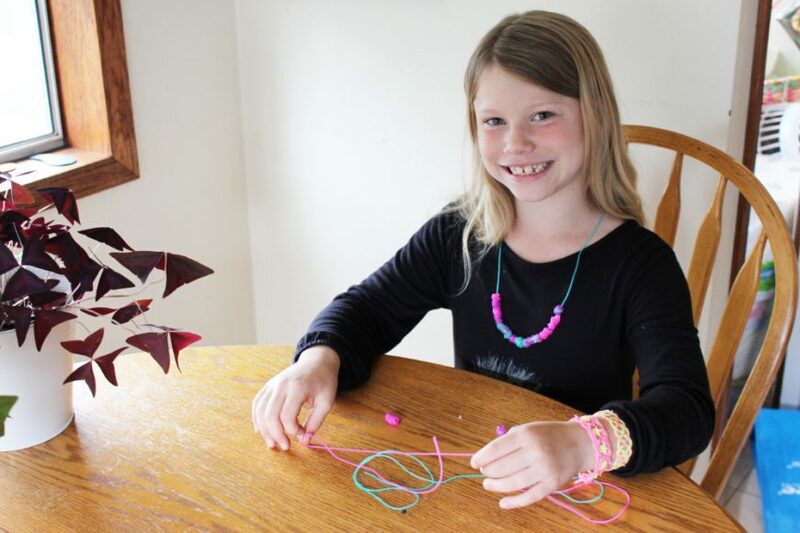 Ava liked the idea of making her own beads to create endless gifts for her friends and family! It retails for $39.99 and suggested age is 8+. The Sparkle Bead Station inspired all types of creativity with her colour selection for making beads to how she designed her necklaces after! You just have to be sure that you make nice thick lines that fully connect or they can break as you peel them off once they dry. The bracelets that Ava created with the Gel-a-Peels Pastel and Glow in the Dark accessory kits were my favourite. They required her to follow a pattern, as each kit comes with 16 design templates with different levels of complexity and one drawing sheet. Right away, Ava had ideas for matching best friend bracelets for her and her BFF! 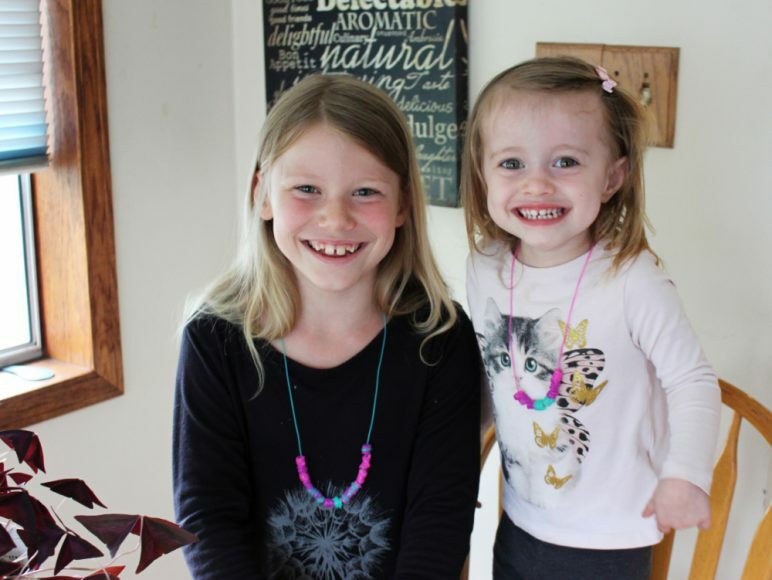 With minimal supervision, it wasn’t long before Ava had necklaces and bracelets made for her friends and even some for Zoe! Zoe got such a kick out of having a big girl necklace like Ava! The kits are endless a fun, inspiring possibilities and Ava’s confidence flourished seeing the finished product! 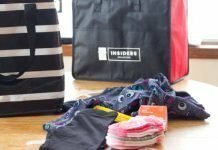 This is the perfect gift for the little fashionista in your life! Design, Peel, Wear & Share! This patent pending innovative gel compound and crafting kits was a huge hit in my house. 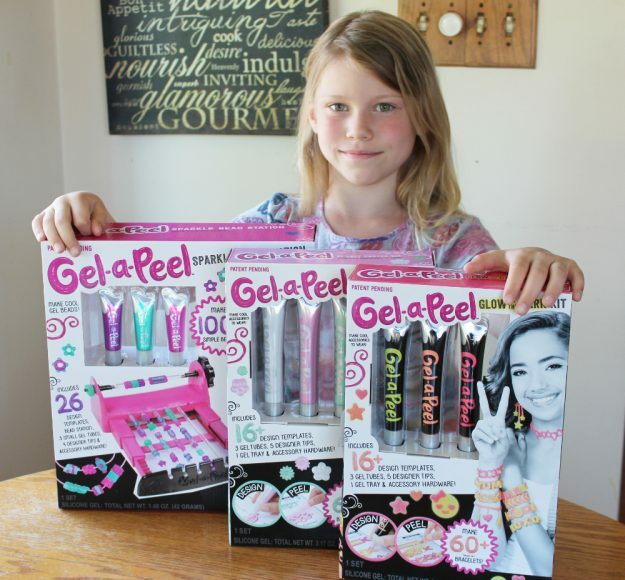 Gel-a-Peel provides tween girls with an easy way to design their own trend-forward fashion and fun accessories. We’ve already organized a few play dates to have some of her friends come over and try it out themselves. Just trace the templates, peel the gel design and the creations are ready to wear and share! We’re giving one lucky reader all 3 kits to have their favourite tween try them out themselves. ENTER BELOW! 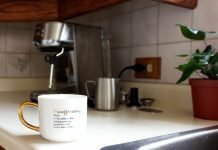 GIVEAWAY only open to Canadians! Gel-a-Peel Bead Station, Pearly Pastel Kit and the Glow in the Dark kit have retail for $29.99- $39.99, are recommended for ages 8+ and can be found at Indigo, Indigo and Indigo. 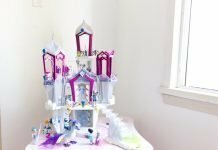 DISCLAIMER: We have partnered with MGA Entertainment for this post and have received the 3 kits in exchange for an honest review and giveaway! These items are not meant for toddlers and should be supervised if they are wearing them! My daughter’s favourite accessory right now is a flower headband/crown thing. It’s very hippy-ish ? Favourite accessory right now is hair bands and hair ties!! my daughters favourite accessories are necklaces! Sadly the favourite accessory right now is a cell phone ? Wow this is so cool! My daughter and nieces would LOVE this! My child’s favourite accessory right now is a orange ball hat! My granddaughter’s favorite accessory is her purse. This looks so fun! I know my daughter would really love this! She is so creative and loves jewelry. My niece loves headbands and earring right now. I think she would have fun with this. My niece loves any accessories that have chickens on them lol hair ties, bracelets, necklaces, etc. Right now its a cute purse! My lil one is into fidgit spinners right now. They enjoy paying dress up to! My kid loves her sunglasses. My girls love all the pretty headbands that are the latest trend. Butterflies and flowers and beading…the more embellished the better :). Oh my gosh, this is such a fun idea to do with your daughters!